You can also check out Jeb in all his glory verbally sparring with the one and only Mr. Donald Trump. Jeb has received some flack for receiving donation’s from “special interest” groups and Trump was ok with exploiting that. Jeb would counter with, “he is being supported by folks who believe in his mission and trust he will be a great general”. Trump believes he is simply a “puppet” and will crash and burn with the rest of the republican party. 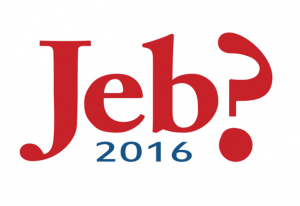 Jeb would later expose Donald Trump for being one of those “special interest”. 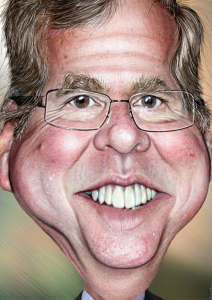 According to Mr. Bush, Trump wanted casino gambling down in Florida but Jeb balked at the offer. This is not his first time running for office, in 1994 he made a run for governor and lost to Lawton Chiles. In 1998 he ran for governor of Florida and won, he also won in 2002 becoming the first two-term governor. Jeb has been criticized his whole political career for his views on economic policy, education policy, health policy and many other policies. He has never wavered on any of his views and dealt with all the cynicism. He does have his followers who believe in his vision on reducing taxes. He actually did govern a 19 billion dollar tax cut in the state of Florida he also vetoed a 2 billion dollar spending clause. He is married to a Mexican born woman and boy does that create another ball of controversy in itself. Illegal Immigration to this country has been something that Mr. Trump denounces. Jeb also stands by his brother and how he ran this country while in office. Now I continue to mention Trump in this post is because Jeb and Trump literally can not stand to be in each other’s presence. If do Youtube, Google, Yahoo, Bing searches you will find tons of videos and post on their back and forth history. We believe that Mr. Bush will pull off the presidency even though Trump is leading. Trump has stepped on his own toes numerous times with all his controversial remarks on women, immigration and health policies. It’s up to the American people to choose one of these candidates to lead us into the next 8 years. Who will you vote for? Why would you vote for this particular candidate? Ask yourself these questions before you drop that ballot the future relies on the American people and their vote. Hillary, Jeb, Bernie or Trump who will you pick?